This is a simple, delicious dish that you'll want to cook over and over again. Place 2 medium frying pans on the hob. Divide the oil between the pans. Place the sliced onions and mushrooms in one pan and cook for 6 to 8 minutes. Add the baby spinach, butter and cream and cook for a further 2 minutes, until the spinach has wilted down. Season with salt and pepper. Season the hake with salt and pepper and fry for 4 to 5 minutes on each side in the other pan, until cooked through. 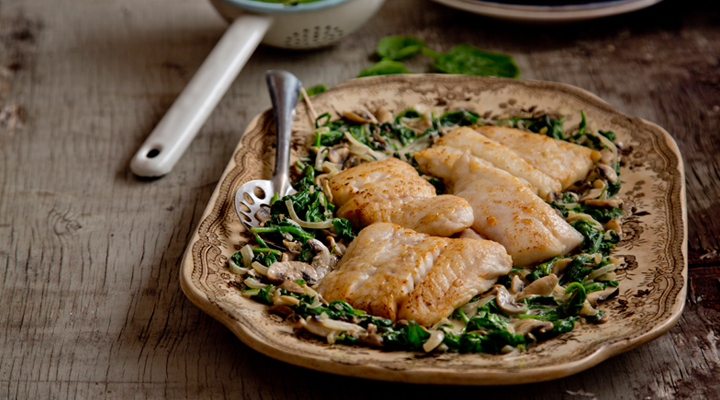 To serve, divide the creamed onions, mushrooms and spinach between four plates and top with the pan-fried hake. This dish was divine. I forgot to buy cream but added a little extra butter to the onion, mushroom and spinach and that worked well. Made this tonight, lovely combination but far too much sauce. 75-100 ml of cream would have been better I think. Otherwise it was very tasty.